What kind of foundation should one use in a hive? Now there’s a question that can start hours of conversations, and, sometimes, arguments. I thought I’d weigh in with my two cents on the subject. What I write about is what I have done, currently do, am contemplating doing, or just find fascinating. It’s personal. Beekeeping is personal and local. What works, or doesn’t work, for my bees and me may or may not work for you. There are many factors ranging from personal beliefs to the nectar flow in your area to the types of bees you prefer – which takes us right back to personal preferences. I currently use wax foundation in my hives. I have used Pierco plastic and have gone foundationless. I have not used the fully formed plastic frames, or was foundation pieces with vertical wires imbedded in them. The former hold no interest for me. The latter I don’t get – I figure it takes the place of wiring a frame, but wiring is so easy. You know that moment when you say, “I’ve got to super the hive, NOW!! !” , and you realize you don’t have any foundation in the frames you made last winter? There are no issues with plastic. Just pop the foundation in and you’re heading for the hives. I have friends who run hundreds and thousands of hives. The time it would take to wire all those frames makes using wax would cost a lot : in both time and money. In non-scientific tests in my bee yards I’ve found that it takes my bees nearly twice as long to draw out a plastic foundation than a wax foundation or foundationless (when this latter option has worked…more on that below). Other beekeepers have found plastic to work just fine for them. Could be my bees (Russians X New World Carniolans X Feral Bees). Could be our “fabulous” nectar season – last year we had all of 2 months due to extreme rains in June that kept the bees in. In a good year we have about 4 months. Plastic foundation is waxed, and according to Pierco’s site, with US produced, chemical-free wax. However, there’s just not enough laid on to make the bees happy. Sometimes there’s barely any wax at all. So I used to melt wax then brush it onto the plastic foundations. What a pain. By the time I did that, I might as well have wired the frames. If you don’t pressure wash, bleach, and rewax your frames, you’ve still got to get rid of them in one, three, five, or some number of years depending on your hive protocol. They’re plastic, they won’t biodegrade if you toss them. So you could pressure wash and recycle. My best is that most are tossed in the trash. Pierco’s website states that their plastic frames are made with FDA approved food plastic. There are, however, seven types of FDA approved food plastic, some better than others. Repeated calls and emails to Pierco asking which type of FDA approved food plastic they use have gone unanswered. Maybe they’re just busy. If I ever get a reply, I’ll up date this blog. In the meantime, it makes me wonder? Why not just say? Personally, I don’t like plastic. I use it when I need to in construction, but if I have an option, I always choose something other than plastic. It is a personal preference. If you get American Foulbrood (I hope you never do, but it’s around). You must burn the foundation. Plastic, regardless of they type, is toxic when burned. So you must heat the frames until the wax begins to melt, then wrap the farmes tightly in thick plastic tape them up and dispose of them. When melting the wax portion of the foundation, you should probably wear some sort of gas mask. As I said before, my bees draw out the wax foundation much faster than they do the plastic foundation. With a short season, the faster we get to drawn comb the better. You can cut your sheets of foundation in halves or thirds and install the foundation in the top of the frame, leaving the rest of the area for the bees to build what they desire. For me, this works better than foundationless (the next section). The image here is of a full sheet of wax hung on a wired frame. This year I’ll hang more partial sheets. Back to American Foulbrood : You simply burn all the foundations in a hole which can be covered with soil. They which burn really well because of the wax and wood. Beeswax foundation is made from (all together now) bees wax. This wax, in the U.S., is from commercial hives. The majority of commercial hives in the US regularly use antibiotics and synthetic pesticides. These chemicals stay in the wax. So when you are using wax foundation you are putting small amounts of these in your hive. The amounts are considered so small that we all probably enounter more in our daily lives, but they are there. It’s not that hard really. I don’t nail or have a stretcher board. 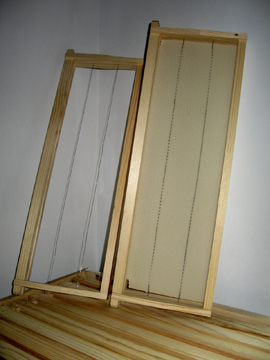 I just weave and twist : here’s a link about how I wire frames. Another disclaimer: Every year I try this. Every year it doesn’t work out very well for me. BeeBehavior.com has an excellent description of working with foundationless hives. Another fabulous source is Michael Bush’s Bush Bees’ Foundationless Beekeeping Page. If you whip out the table saw and start to cut new angles in the tops of your frames, it’s not easy. You can glue a series of large popsicle sticks into the groove on your frame – that the easiest. You can cut a strip of foundation and hang it in the upper section of your frame – a bit harder. The folks at BeeBehavior.com suggest milk carton strips instead of foundation strips. These stright bits seem to give the bees an idea of “go this way” when they start building comb, rather than going free form. It has never worked for me, I wish it did. I keep trying. It is said that the hives must be level, front to back and side to side, for this to work. You don’t need a level, but the hive(s) should look level. For anyone with more than a few hives, this just takes too much time. However – everytime foundationless has worked for me, the hive was no where near level – it was a “mixed” hive: drawn comb with foundationless between. That can work for me. I know others will say you don’t have to, but the first beautiful foundationless frame of honey I had never made it to the extractor room. It was connected on all four sides of the frames (but not wired), but it just fell apart on the way to the extraction room. The above are only three options in foundation, the three with which I have worked. There are others but they will, in the end, all concern some sort of plastic or wax or foundationless. If you have the time and inclination, I would say try all three “types” and see what works best. I will say that when people ask me what I would suggest to a new beekeeper, I always say use wax (I buy mine from Kelley Bee Supply). It’s a personal preference. Do not put plastic and/or wax foundation and/or foundationless next toeach other. In my experience, the bees will draw out the wax foundation first and you will get very wide combs on the wax and almost non-existant combs on the plastic and foundationless frames. Once the bees have drawn out the comb, it doesn’t matter. What’s happening in the bee yards? We’ve had a few nice days (48F – break out the bathing suits!) and the bees have been flying at the front of the hives. My current business project is trying to turn the categories on my two blogs into ones that make more sense. I have to break that “beekeeping” category down. It’s all about beekeeping. What did I know about blogs when I started this? Nothing. I still know, and prefer to know, very little about the workings of the internet. Bees are far more fun and interesting. That’s the news from Brookfield Farm Bees And Honey in Maple Falls, Washington. What kinds of foundations are you using? Have you all found something that works really well? And any tips about how to make foundationless work better are always appreciated. This entry was posted in Beekeeping, Hive Components and tagged Beekeeping, Brookfield Farm, foundation, foundationless, hives, how to, Maple Falls, plastic, Washington, wax. Bookmark the permalink.